About a year ago, a friend of mine introduced me to beauty boxes. Glossybox, and Birchbox were the two she liked best and therefore, recommended them to me. I decided to try them out and at first I really enjoyed receiving them each month. However, after about 6 months or so, I started to become less impressed with what I was receiving and I wasn't really using the products. I still have a cheeky peek each month to see what people are getting from them -but very rarely do I decide to order that months box. When I first started thinking of cancelling the beauty boxes, I looked online to see what other monthly subscriptions were available. That's when I came across My Little Box. At the time (this was maybe 6 months ago or so) they only delivered to France and I think a couple of other countries in Europe....now they've brought it overseas to Britain! 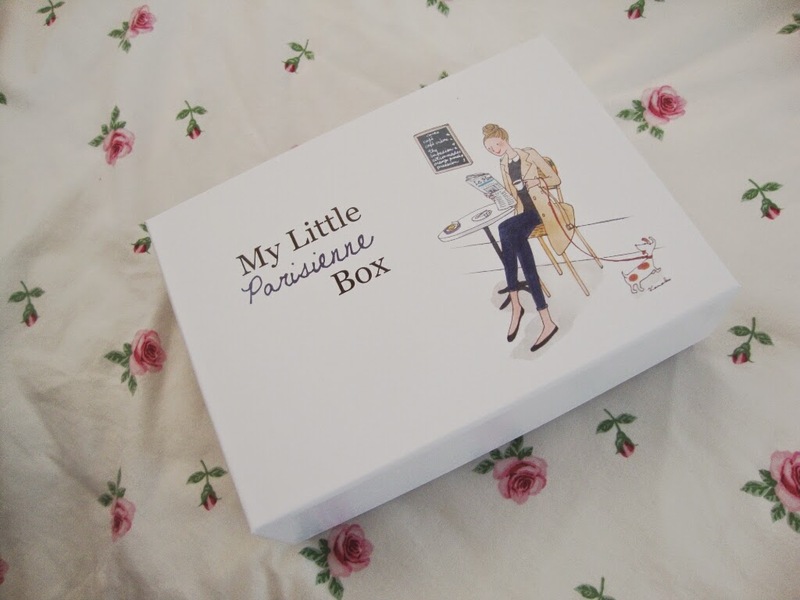 My Little Box is a Paris based beauty, fashion and lifestyle box and this month is the first in the UK! The box was originally created by five friends and includes adorable-ness all over! Each month you'll receive fashion and beauty items created exclusively for MLB, as well as their own cosmetic range and some collaborations with popular brands. Each month has a completely different theme, and previous boxes have included weekend, party, and smile themes. With cute illustrations and a charming French twist, this is a box that definitely stands out from the subscription crowd! 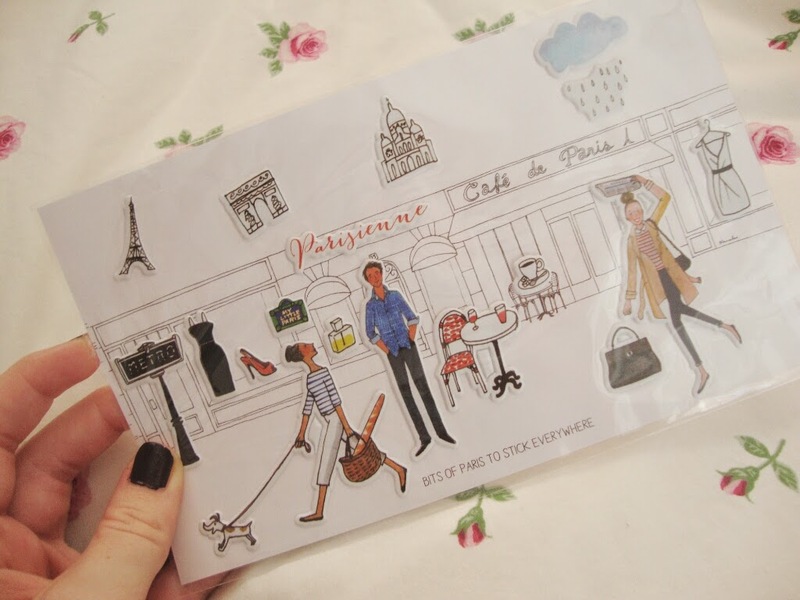 For September, and also the first British box, we get thrown into the delightful world of Paris! 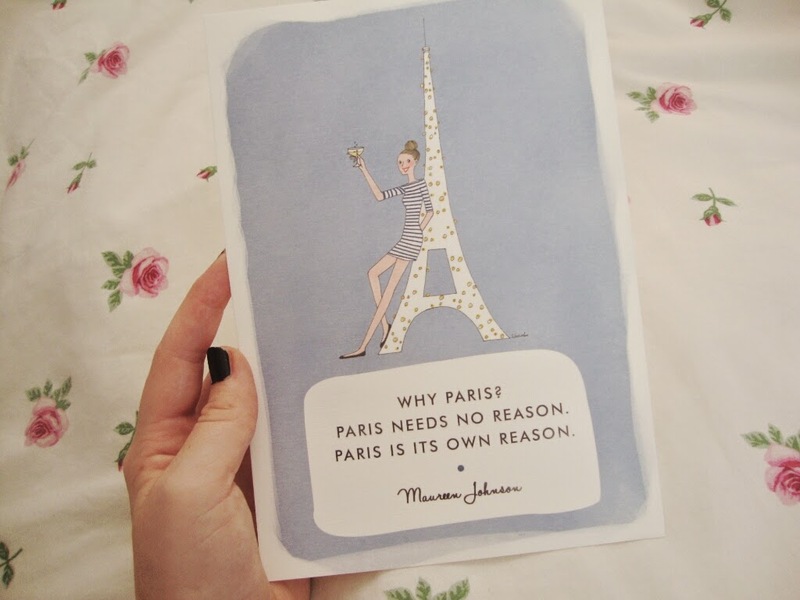 Now, some of you may recall me writing about my first trip to the beautiful French capital nearly a year ago, so I was incredibly happy to find a box full of Parisian goodness. Apparently, in each box you receive a small magazine - My Little World- which follows the theme for each month. 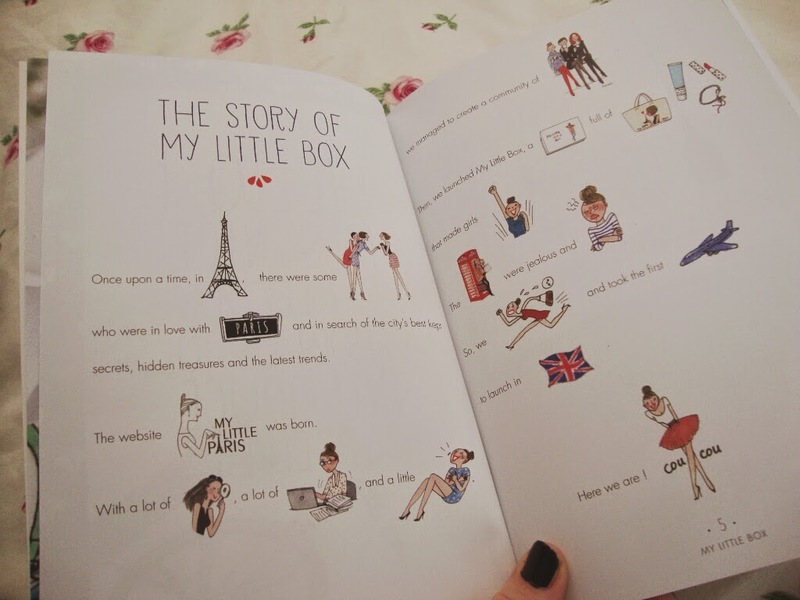 I didn't get any magazine (this maybe because it's the first UK box), but I did however, receive this cute little notebook -where the first few pages are filled with drawings and a pretty little story introducing My Little Box to you. Please note the rest of the book is plain paper for you to jot down anything you wish! Each month comes with an adorable little bag filled with make up! And what girl doesn't love make up?! The first product in the bag is an item by MLB's own beauty range My Little Beauty. Stylo Lumiere is a Complexion Brightening Pen, great for on-the-go fix ups! It can be used as a foundation touch-up or even as eye shadow primer. I personally tried it out underneath my eyes for a quick-fix and it worked wonders. 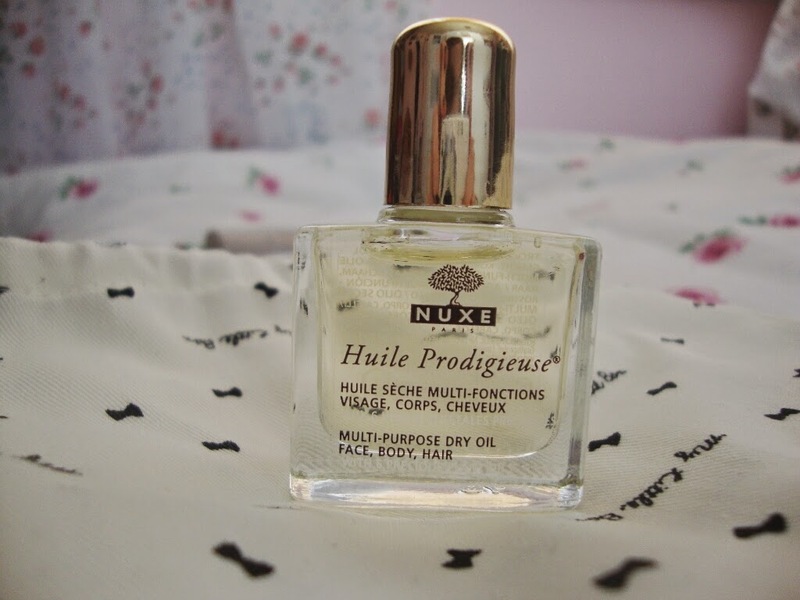 Huile Prodigieuse by Nuxe, £17 for 50 ml. Huile Prodigieuse is said to be the "luxurious, must have beauty item that all Parisian women use." A multi use item, the oil can be used on your hair, your skin, even your face. Anywhere you want to feel silky and look fantastic. I have heard of Nuxe before, but not Huile Prodigieuse, and I've heard some very good things about the company. So, I'm very excited to try this out and pretend I am proper French beauty! The bottle I received in my box is only 10ml, however, it can be brought for either 50ml or 100ml, so it's still pretty travel sized and can easily be kept in your bag for use whenever you may need it. 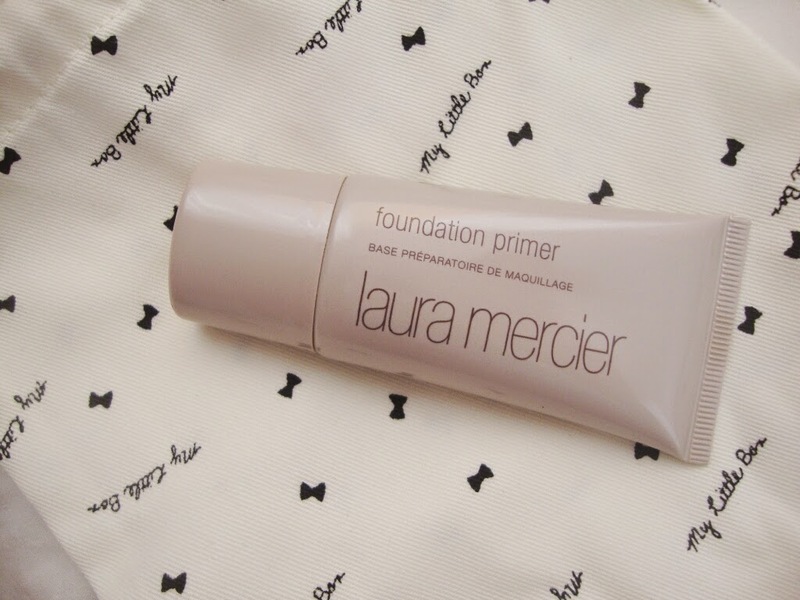 Foundation Primer by Laura Mercier, £29 for 50ml. 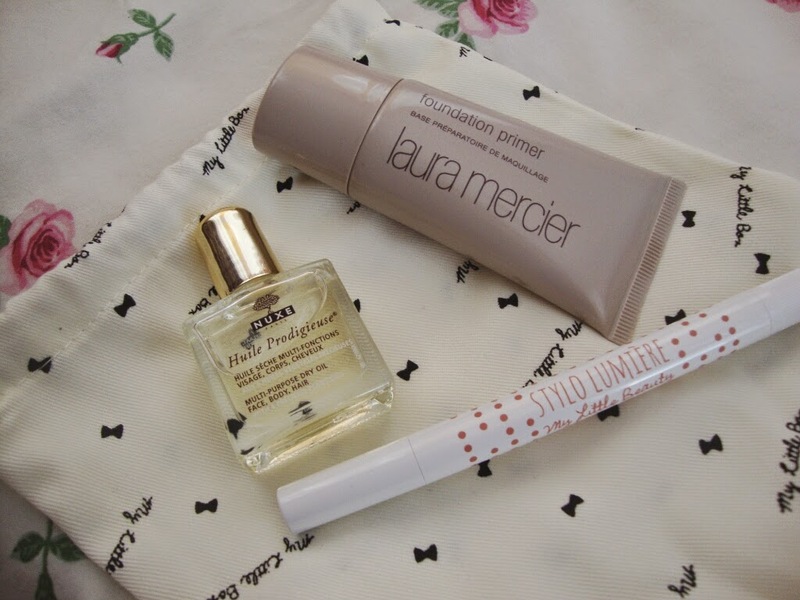 The third and final item in the little bag is the Foundation Primer by Laura Mercier. Now, primer's are something I know very little about. but this is an item I've seen many bloggers talking about. Obviously, apply it before your foundation. Or, if you're like me and don't wear foundation, you can wear it on it's own for a fresh and natural glow to your skin. My only downside so far is that it seems to have a strange smell to it that I don't personally like. The two other lifestyle based products were little pack of stickers and a laptop/ ipad case. The stickers are 3D and the cute illustrations match the designs of the box/notebook. You can stick them anywhere you wish -your phone, computer, or even your new notebook. The last product in the box is an adorable laptop/ipad case for when your travelling. Again, the case features the same illustrations as before, designed exclusively for My Little Box. It is a very lovely quality and appears to be well-made and strong, an item which would probably cost a fair bit to buy from a shop. It even comes with an adorable little dog on it, and who doesn't love adorable little dogs!?! Unfortunately, it doesn't fit my laptop, but it is a lovely gesture that hopefully I'll be able to use it in the future. It also came with this super cute poster/ drawing! I am incredibly pleased with my first My Little Box, and I'm already excited to see what next month's theme is! A part of me wishes they uploaded a sneaky peek a few days before! I think this is a delightful subscription box, and if, like me you're tired of receiving make up/ beauty items that you're either disappointed with or just know you won't use, then I think this is perfect as it doesn't just include beauty bits. Of course you can choose to opt-out at any point you like. Now, I know what you're thinking, £14 a month and you don't know what you're getting?! Yes, but the products inside the box are worth £50+, you'll receive products from well respected brands/companies and even completely exclusive items that you'll only find within the box. And with the added quirkiness and gorgeous drawings featured throughout (which I forgot to mention are all designed by in-house artist Kanako) I reckon this is an absolutely lovely gift to yourself (or a friend) each month! What do you think? Will you be signing up? P.S- This is the first review I've done of this size/this in depth and I am really quite proud of myself! If I continue to be happy with these boxes then expect more reviews like this! Listening to: Ok, I'm watching Charmed.